You may not realize it, but your gums do a lot to protect your teeth. Isn’t it only right that you should protect your gums from harm? While restorative dentistry offers a number of advanced treatments that can return damaged gums to good health, it is far preferable to maintain the health of the gums before they fall prey to disease. Unfortunately, most adults fail to keep their delicate periodontal tissues healthy. In fact, gum disease is the most common disease among American adults, affecting approximately 75 percent of our nation’s men and women to varying degrees. Thankfully, gum disease can be treated, whether in its earliest stages, when it is called gingivitis, or in its more advanced stages, when it is called periodontitis. At Signature Smiles in Woodinville, gum disease treatment of the highest quality is available to help our patients achieve excellent periodontal health once again, no matter which stage of the disease in which they find themselves. At Signature Smiles, we offer the full range of gum disease treatments. The type of gum disease treatment that is appropriate in your particular case will depend on whether you suffer from gingivitis or periodontitis and the extent to which your periodontal tissues have been damaged. Once you have received treatment for your gums, it is important that you visit our office at least twice a year as recommended by the American Dental Association for professional exams and cleanings so that you can maintain good oral health. This way we can keep your gums healthy and treat any potential flare-ups as early as possible. Deep cleaning: Deep cleaning comprises two separate treatments, scaling and root planing, commonly performed together. Scaling involves the removal of plaque and tartar - and the bacteria they harbor - from at and below the gum line and from within gum pockets using a special instrument. Root planing involves making the surface of the tooth below the gum line smooth so that bacteria will not seek refuge there and the gums will more easily reattach. Pocket depth reduction surgery: This procedure involves pulling the gums away from the teeth so that bacteria can be removed from deep beneath the gum line. The gums are then sutured back into place so that they can heal. Gum grafting: If periodontitis has caused your gums to recede, the missing gum tissue can be replaced through gum grafting. This procedure involves relocating soft tissues from elsewhere in the mouth, such as the roof or sides of the mouth, to the gum line. 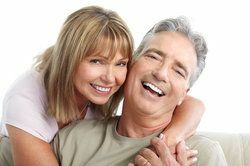 Dental implants: If you are missing one or more of your natural teeth, dental implants can be used to reconstruct these teeth from the roots to the crowns. Because the implants are made of titanium, which the body does not recognize as a foreign substance, they prevent the degradation of the gums that normally occurs when teeth are lost. To learn more about gum disease treatment, please contact Signature Smiles today.